Ferrofluid, camera, electromagnets, custom software. For the alchemists, ‘prima materia’ referred to matter in its primeval state. Equated with Mercurius, the world-creating serpent concealed in matter, the prima materia symbolised the infinite diversity of form in the material world. Prima Materia is an installation probing the entanglements between human understanding of natural form and the technologies used to manipulate it in laboratory practices. 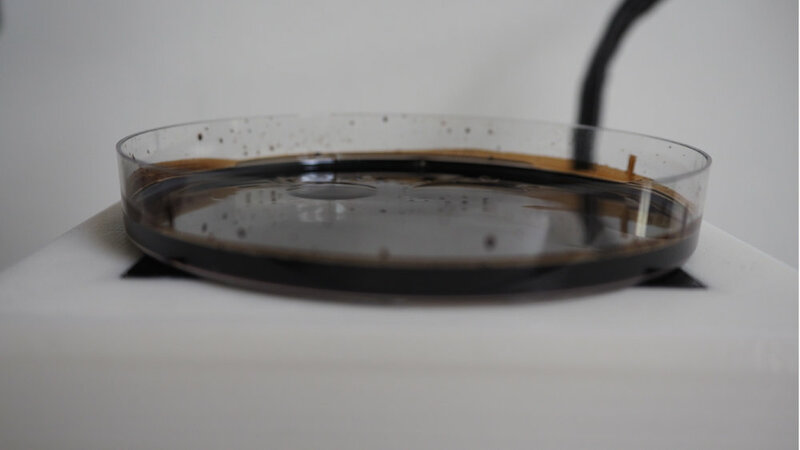 A camera points at a petri dish of ferrofluid, an oily liquid that takes shape in the presence of a magnetic field. Analysis of the camera feed extracts motion data from the surface of the liquid, which is then used to drive the pulsing patterns of electromagnets beneath the fluid, in turn affecting its patterns of motion. The process of input, analysis, and reaction is visualised on a nearby screen. The system forms a feedback loop in which the natural tendencies of the ferrofluid are continually interacting with an external system comprised of physical, electrical and software components. The interaction is mutual and self-regulating, questioning the extent to which the process of science can be distinct from its object of study.